I made these Christmas Stockings as a gift for people that I love. I used scraps from other projects to make these. The process is called String Piecing. I attach the strips of fabric to both a backing and the batting. That way the stocking is quilted and the fabric is assembled at the same time. I then cut the shape of the stocking out and sewed it to the backing. 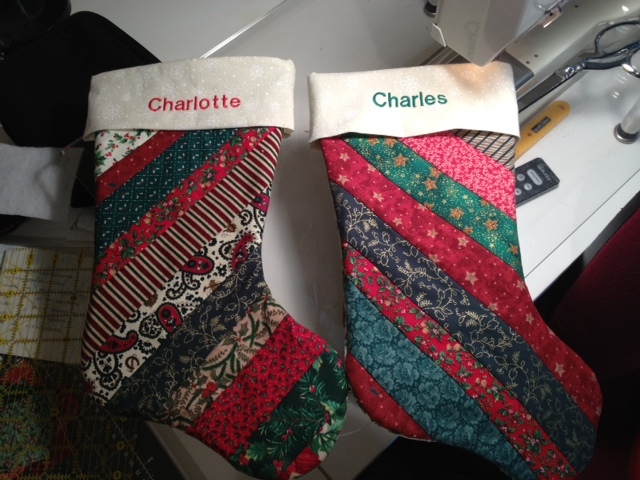 I used my little Embroidery machine to put the names on and them attached the collar to the stocking. Such fun. I am able to show you this picture because I have already given this gift. You can’t give Stockings on Christmas because Santa needs to be able to fill them on Christmas Eve. They need to be hanging by the fireplace. Buddy needs a stocking. Just sayin’.